Grande Vegas Casino has just unveiled the new Sweet 16 slot game with RTG's new "morphing symbols". Until the end of the month get 25 free spins on the mouth-watering new real money slot game at the online casino that brings a bit of Las Vegas to your computer, smartphone or tablet. To claim your free spins use bonus code SWEET-25SPINS (valid until December 31, 2016). Sweet 16 features Realtime Gaming's new Morphing Symbols. Symbols in winning combinations morph into a new symbol which can create additional wins. Morphing continues until no winning combination occurs and prize multipliers increase with each win – up to 10X. New real money online slot features Morphing Symbols. The Scatter is a Lollypop. Three or more Scatters trigger 16 Free Games with morph multipliers up to 20X. On reels 2, 3, 4 and 5 Wild symbols expand to cover the entire reel. 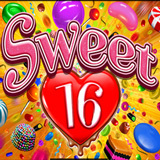 Sweet 16 is an All Ways Pay game – there are 243 possible winning combinations on every spin. You can play the sugary new candy-themed game in the download, instant-play and mobile casino.